Thoughts on the Sailors Fusiliers and Loyals Gallipoli Talk 2015. This wonderful blog post was written and researched by Shaun Carter, who is a volunteer at Bolton Museum and Archive. When I volunteered to do a 30 to 45 minute talk on Bolton’s role in the complex Gallipoli Campaign little did I realise what I put myself in for! I was aware of some parts of the campaign the Naval Assaults and the Lancashire Fusiliers landing. The focus on Bolton meant that the French and empire efforts were to take a backseat. The exception being Bolton folk who had immigrated to parts of the empire. I took the opportunity to look at the secondary book sources in the Library reading extensively and creating the booklist for the talk. This gave me a sense of the scale and importance of the campaign. The controversial nature of it quickly came to the fore as Churchill’s brainchild. It was a means of breaking the deadlock of Trench warfare on the western front to knock Turkey out of the war by using naval power to force the straits of Marmora seize Constantinople and get aid through to Russia. Any plan never survives contact with the enemy. In this case the failure to force the Straits by Battleships alone now meant that a purely Allied naval campaign became an amphibious assault on a scale never attempted before. The Turkish and Germans had time to prepare and were consistently underestimated by the Allies throughout it. Having landed ashore the campaign became a race against time between the Allies and the Turks to destroy or expand the bridgeheads. Trench warfare was conducted in brutal heat and unsanitary conditions at close proximity with heavy losses on both sides. Ultimately the allies had insufficient resources to overcome the Turks. The most successful aspect of the allied campaign was the withdrawal. I used the Bolton Journal newspapers copies in 1914 and 1915 in the Bolton Library and museum archive collection as the primary source. That gave me a local perspective of what was reported at the time and the chance to tell some local stories. The reportage of events I found in the Bolton Journal was factually accurate quoting official sources and personal letters home. As time progressed it reflected the initial optimism that a quick success was possible moving to the final disappointment of the failure of the campaign as these were not realised. There was a three week time lag between the event and its reportage a reminder of the importance of the newspapers and a reminder of how much more slowly information passed to the public. We should also remember when reading these that censorship was in effect. In addition there was little photographic information. Official dispatches, correspondent’s accounts and letters to home were the main sources of reportage. It is a world away from the 24 hour reportage of today. What I found in the sources came as a shock to me in the scale of operations and losses incurred was far bigger than I had hitherto thought. The Naval Assaults pitted Battleships versus shore batteries which for the most part the latter won. The decisive factor however was the lack of reconnaissance of the Turkish minefields and the inability to clear them. The use of trawlers to clear them under fire from shore was unsuccessful. The result caused the loss of 3 Battleships on 18th March 1915 and seven hundred casualties to their crews. This failure resulted in the nature of the campaign changing from a purely naval affair to a combined arms one involving an Amphibious assault to land allied troops to take Constantinople. This was a significant shift in the means of achieving the strategic objective. The time taken to deploy these troops gave the Turks and their German allies plenty of time to prepare strong beach defences. The element of surprise had been lost. 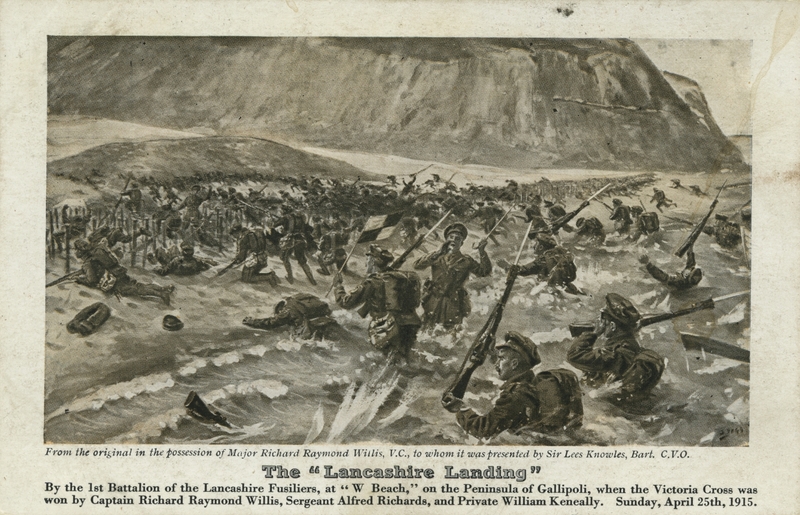 The landing at W Beach by the 1st Battalion Lancashire Fusiliers has become part of the Gallipoli myth. Some 1000 British soldiers in boats landed opposite a company of 114 Turkish soldiers without machine guns in prepared positions, trenches, barbed wire and mines. The cost of clearing them was very high with 284 killed and 253 wounded. Their gallantry was rewarded in the granting of six Victoria Crosses. There was a strong Bolton presence in the Battalion as noted by the numbers killed and recorded on the Diversity in Barrier-Breaking Communications and http://www.boltonlams.co.uk/archives/first-world-war-centenary websites. The growth of forces committed to the Gallipoli campaign meant that there was now competition for scarce resources of troop’s men and materials with the Western front. The role of the Sixth Battalion Loyal North Lancashire regiment at Achi Baba is little known unless you have read the regimental history. The Loyals were overrun by a Turkish human wave attack part of an action which pitted two untried British Battalions versus 12 Turkish ones. In two days it suffered casualties on a scale which are unimaginable in the present day. Some 494 men lost of who 222 were killed. In the newspaper I found out about the losses in the Fisher in family who lost 3 of four sons in two days a parallel with the Saving Private Ryan film. The Achi Baba action was decisive for the Turks in securing the strategic objective of the high ground and ultimately caused the Allied campaign to fail. As the Gallipoli campaign concluded Bolton people were now aware of the costs in casualties so far as well as just how many had volunteered for service. They were now certain it was going to be a long war. When I researched the talk I was reminded that there is no substitute for primary sources when studying history. I saw at first hand some of the evidence of the tremendous sacrifice made by Bolton people one hundred years ago a humbling experience. As for the talk itself there were 50 attendees which is an indication of the interest in the subject as well as the success of the publicity put out beforehand. It was well received with a lot of questions at the end which I did my best to answer. I will be doing another talk on the Somme and Bolton in 2016! I would like to thank Julie Lamara, Mathew Watson and Jim Robinson from Bolton Library Museums and Archives for their help in procuring materials for the collection and guiding me.